Here’s an interview from earlier that year on the “Donny & Marie” show. It includes a look at his bare right bicep, on which he recently had surgery (the cause of his recent guitar-less shows). He doesn’t have a show scheduled for tonight (if there was, I was thinking of posting a video from that year and this year, but I couldn’t find one from 1999), but here’s a fun video of “Don’t Talk to Strangers” from last night’s show. It especially cracks me up because my kids often point out RS’s bad language. Despite doctor’s orders regarding his torn tendon, apparently RS played guitar at his last show. As if it’s even my business AT ALL what he does. But still. Anyway, from the videos I saw of him NOT playing guitar – when his arm was in a sling – it looked like it was very difficult for him to perform without it. He sure played a mean tambourine though, smacking it to the beat against the mic stand. I also saw a clip from a song where he played tambourine AND harmonica – so both hands were busy. But fortunately, RS is not one to give up. He may have made a great chicken farmer (circa 1979 when he lived in “the Burbs: Glendale, California” with chickens in his backyard, according to his autobiography) or a fabulous stained glass artist (aka the story behind his song “Jessie’s Girl”), but he refused to give up his dream to be a successful musician. 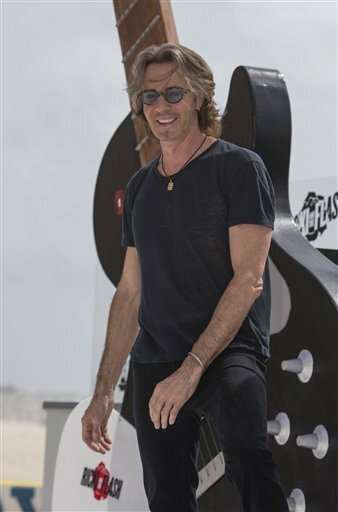 So here he is, at age 68, still making music (what lucky fans we are) and despite the periods of time his dream got diverted, he’s still going strong. Doctor’s orders or not (but, please be careful)! So inspiring to those of us who may be going through challenging times of our own. 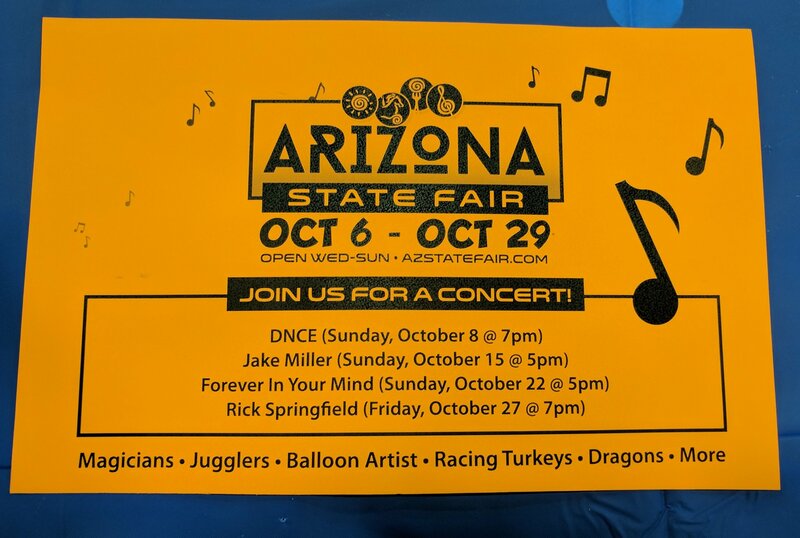 The family and I went to a children’s festival this afternoon and the Arizona State Fair had an exhibit with some carnival-type games for the kiddos. There were also stacks of the flyers shown below. Can you tell what caught my eye? No, it wasn’t the racing turkeys or the dragons, although I am curious about those. Can you guess what day I plan to go to the fair? I’m not sure if this is something that happens to longtime fans of other rock stars, but I’ve noticed that I’ve been experiencing what I’ll call the teenybopper/mother hen syndrome. I’ve noticed it emerging in the past, such as when RS continues his shows when he has the flu or when he sits on stage chugging cough syrup to get through the evening. But it was evident again this past week after he performed right after his surgery for a torn tendon. Yay, people are live streaming videos from tonight’s concert! Those fans are lucky and I feel bad for the fans of the two Canadian shows that got cancelled, but it’s good that he took time to heal. Ooh, he’s wearing a red shirt, he looks so good in red. Poor thing, with his arm in his sling and not being able to play guitar. But it’s good that he’s following his doctor’s orders and not playing guitar while his arm heals. He’s so cute, but he really shouldn’t be holding his microphone in that hand or swinging his arm around that hard, it’s probably going to cause more pain later. Why is he jumping up and down, what about his twisted ankle? Is he really going into the crowd for “Human Touch?” Those fans better be careful not to hurt his cracked rib. I wish I was there to get a human touch. I think this syndrome may be deeply rooted in a longtime fan’s psyche and is caused by the initial stage of fandom when a teenager, combined with now being a mother. (It wasn’t until recently that I realized that he’s only a few years younger than my parents – in those years decades ago when his posters filled my teenage bedroom walls, I don’t think that occurred to me at all.) It’s pretty cool when you think about it, how he was the first crush of so many of the women who are in today’s audiences. And although we look much different than we did at those shows in the 1980s, that part of us inside still shines through at RS shows in 2017.